At Corrigo we make chairs specifically designed to help everything from general postural problems to the most chronic back conditions. When you are investing in an office chair we understand you want to be sure you are getting the best possible chair for you. We want you to have best chair for you and your back. Here are some of our most frequently asked questions, but if you have any further questions or would like to speak with one of our expert advisers, don’t hesitate to call us on 0203 475 4510, or use our contact form here. Ergonomics describes the study of people’s efficiency in the working environment, and is all about fitting the task and equipment to the user for optimum output. 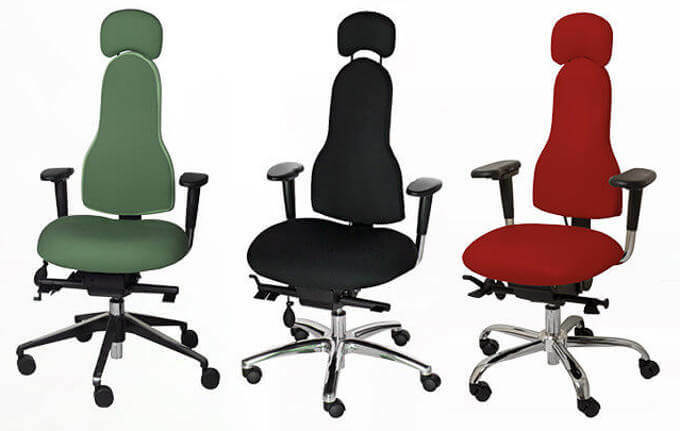 Ergonomic chairs deal with the issue of optimum posture and comfort at the workstation. An ergonomic chair is fully adjustable to fit you and the way you work, supporting your back and promoting good posture. What is the best type of ergonomic chair for my back pain? Every individual and every type of back pain benefits from slightly different seating positions and levels of support. At Corrigo we understand this more than most other standard office chair manufacturers. It’s the reason why we have developed highly adjustable chairs in different styles to suit a variety of back conditions. We will suggest a particular type of chair according to your weight, your height and your back condition, which can be anything from general postural pain, to RSI, sciatica, scoliosis, slipped discs, frozen shoulder or neck pain. Take a look at our range of chairs according to your particular back problem here. How does a poorly designed office chair affect my back? Poorly designed office chairs, and even well-designed chairs that aren’t set up correctly, will have an impact on your posture and can contribute to back problems and back pain. Sitting for hours at a time in a poorly designed chair may even be the sole cause of your back problem. It all comes down to supporting the spine, and sitting in a poorly designed chair will distort your spine out of its natural S-bend. Slouching and tilting the pelvis contribute to strained ligaments and compressed intervertebral discs. How will a Corrigo chair help my back pain? Corrigo chairs are designed to support your back and keep you sitting in a natural upright S-position. At Corrigo we understand that every person is different. It’s why we have developed chairs with a high level of adjustability, so you can have an office chair fitted to suit your back exactly. All of our chairs have been designed by Nichola Adams, (MSc Ergonomics, Tech CIEHF), through years of research and collaboration with physiotherapists. A Corrigo chair will support your lumbar spine and your upper back. The backrest is designed to cradle the back in exactly the right place for you. Our slim upper backrests also ensure an opening of the chest and more freedom of movement in the shoulders (instead of pushing you forward into a slouch, like most broader backed chairs). Adjustable arm rests ensure you are sitting comfortably in the correct seating position. The adjustable seat length ensures your lower limbs are properly supported. A coccyx cut out can also be specified. What’s the difference between your Libero and Diffusion range? Following years of research and collaboration with physiotherapists, we developed two main chair ranges, both highly adjustable and available in 3 sizes. Both ranges are highly adjustable and support your own perfect working posture with contoured backrests, inflatable lumbar support, uniquely placed armrests and the option for free float or set support to keep you at your optimum sitting angle. Both chair ranges are designed with the same principles in mind – to offer fully adjustable support to fit you and the way you work, support your back and promote good posture. Our Diffusion range offers excellent support for most back complaints and general postural pain, and is the more affordable option. We would recommend our premium Libero specialist chair for people suffering any back problems from general postural pain to chronic back conditions. The highly padded seat of the Libero chair is horseshoe shaped offering extra sitting comfort for back problems. If you want to know more about our chair ranges, give us a call on 0203 475 4510. Our expert team will answer any queries you may have. What back conditions can your chairs help? Our chairs won’t cure a chronic back condition overnight, but they will offer you the correct support to help you work with less pain and help you maintain the optimum position for a healthy posture and a subsequently healthy spine. Many back conditions can be helped by our chairs because the root of the problem was a poorly designed chair in the first place. Our chairs can help with general postural pain, as well as chronic back conditions such as, sciatica, slipped, degenerated or bulging discs, neck pain, knee and hip pain, fibromyalgia, spondylolisthesis and hyper mobility syndrome. The majority of our clients have been receiving treatment from a physiotherapist or osteopath, only to undo all their good work as soon as they sit back in their chair. Corrigo chairs help to stop this vicious cycle and is the reason why top physios and osteopaths recommend our chairs to their clients.